Khaled Hosseini was born in Afghanistan and his family received political asylum in the USA in 1980. He lives in California and he works as a physician. His first book The Kite Runner was published in the UK in September 2003. Mariam, born out of wedlock suffers with her mother during her childhood days... dreams of happiness and yearns to be with her father, Jalil. Then, she day dreams a lot and like any innocent child hope to see a ray of light at the end of dark tunnel. However, life gifts her only bundles and bundles of dismay and sufferings. She faces them and endures them. Her early marriage with Rasheed only adds to her miseries. Her transformation from a little girl, to a married woman and then a responsible mother is brilliant. Rasheed as an old sturdy husband doesn’t try to create any sympathy in reader’s mind. He is a male chauvinist and he is unapologetic about it. His love for son is, however, commendable. Laila as an easy-go-lucky little girl... who is fanatically in love with her childhood friend Tariq... who yearns for her mother’s love and strives hard to stand up to her father’s expectations steals our hearts. Then, her moral dilemma when her life changes upside down makes her come across as a strong capability. The characters of Jalil, Mariam’s father... Tariq, Laila’s childhood sweetheart... Nana, Mariam’s mother... Little Aziza and Zalma... is well defined. The book is a work of brilliance. It beautifully captures the miseries of Afghan women. It also speaks about how their lives lessen to nothing when Taliban takes over. 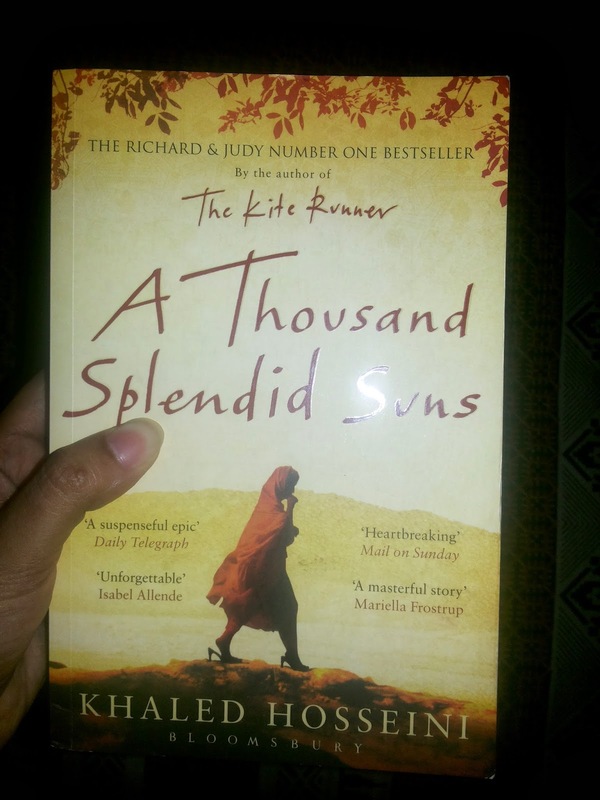 Their silent sobs and pangs of aching heart can be heard in each page of this 400 odd paged book. Their oppression and helplessness, their pain and that buried boldness is narrated heart-achingly. The beauty of this book is that it has an Universal appeal owing to the fact that it speaks about relationships ... The relationship between mother and daughter described in a detailed manner. And as I read the last few pages, I couldn’t stop my eyes from shedding a few precious droplets for Mariam, who stole my heart. I believe that this book is perfect and I don’t dislike anything about it. There was not a single boring moment. I can bet that you will feel happy when you close the book... After all, few hours well-spent!